On October 15, ten thousand people gathered in Seoul Plaza in front of Seoul City Hall to celebrate the launch of a new progressive party. The Minjung (People) Party is the amalgamation of two left-leaning parties, the New Progressive Party and the United People’s Party (Minjung Yonhap Party), and is a party of workers, farmers, urban poor, women and youth resolved to complete the “candlelight revolution” that ousted [South Korean President] Park Geun-hye earlier this year. Just last week during our Maine Peace Walk we had mostly clear skies while we walked throughout the city of Bath. But as each day went on the sky began to fill up with toxic chemtrails. Here in Maine chemtrails are a regular part of the day time sky. I first saw chemtrails some years ago while at a day-long protest in Albuquerque, New Mexico outside of a space nuclear power conference. People pointed them out to me as over several hours we watched the sky being laced with chemtrails from horizon to horizon. At the time I thought of them as a giant spider web. 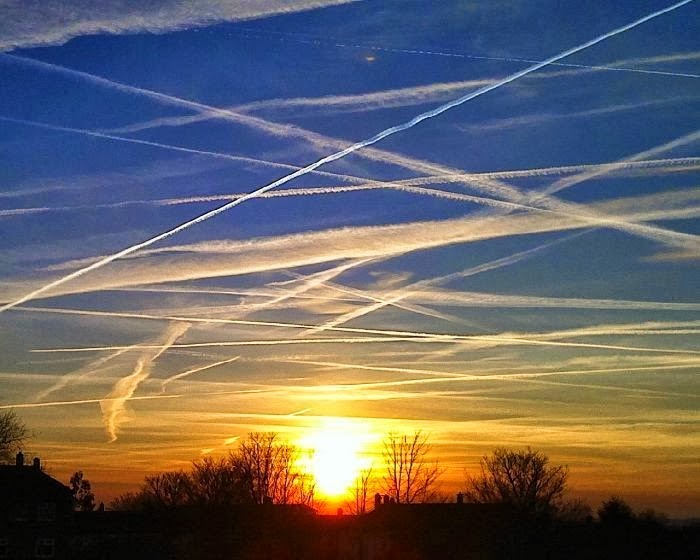 The government has long refused to acknowledge what they are doing to the sky. 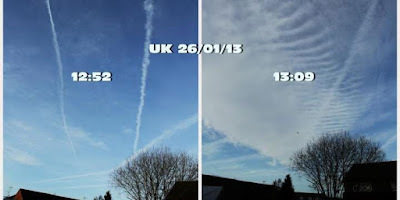 But thanks to organizations like Geoengineering Watch and many volunteers all over the world the evidence is now massive to support the claims that the corporations that control most of the world governments are responsible for this. 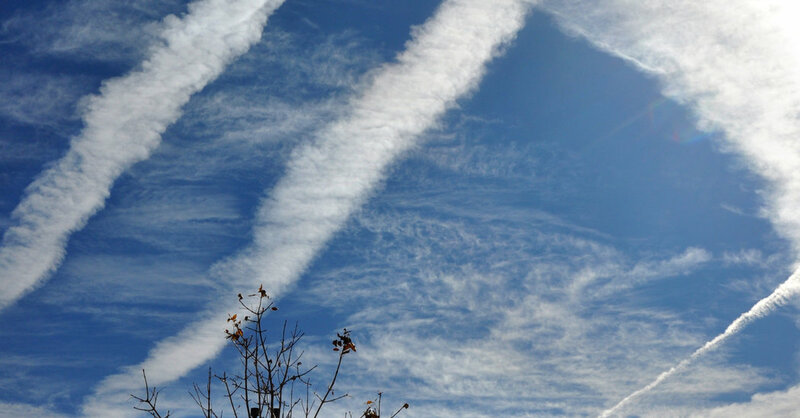 The reflective and toxic metal particulates create artificial cloud cover that increases the Earth's "albedo" meaning reflectivity. Aside from the fact that the elements being sprayed are highly toxic, so far so good, right? Mission accomplished? Not exactly. The long and dire list of negative consequences from geoengineering exponentially outweighs any perceived benefit. A few of the consequences are ozone depletion, completely disrupted hydrological cycle (drought and deluge), poisoned and sterile soils and waters, massive resulting forest and species die off, altered wind and ocean currents, and the triggering of catastrophic climate feedback loops which threaten all life on Earth. 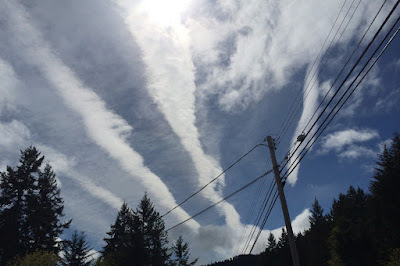 All available evidence - including 750 page Senate documents, presidential reports, and climate engineering patents - indicate global geoengineering/Solar Radiation Management programs were first deployed at a significant scale in the mid 1940's. 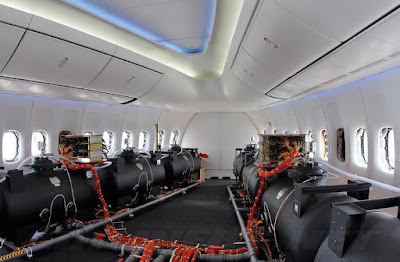 The toxic heavy metal fallout from the ongoing aerosol operations has been confirmed with dozens of lab tests from the US and other locations around the globe. 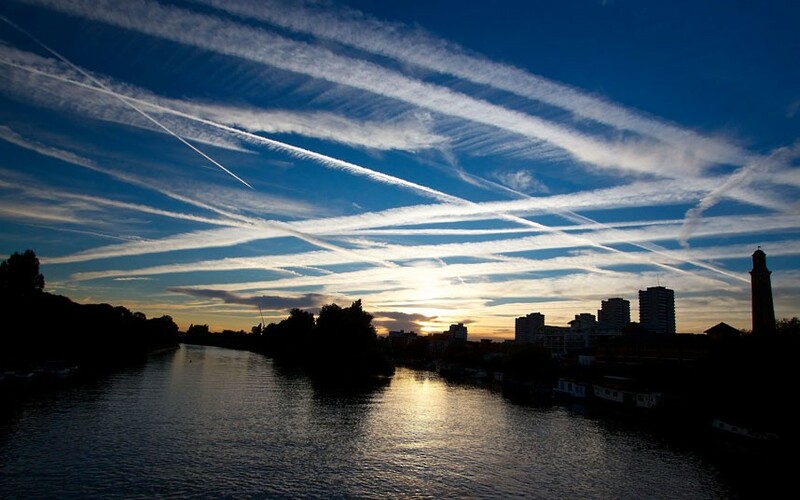 Elements such as Barium, Aluminum, Strontium, and Manganese [are] showing up in lab tests of precipitation in extreme quantities across the globe. Any bright trail behind a jet that lasts much more than a few seconds is likely not just a [normal] condensation trail. 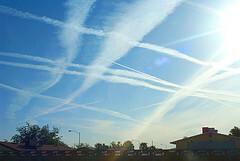 "Aerosols" is simply a term for a microscopic particle that is suspended in the air. A primary stated goal of the geoengineering programs is to provide a "solar shield" to slow "runaway climate change" by spraying tens of millions of tons of highly toxic metal nano particulates into the atmosphere from jet aircraft. Numerous lab tests have determined that the soil PH has been radically altered in the forests of the Pacific Northwest. Aquatic insect populations have also been severely affected by metal contamination in the formerly pristine watershed in regions of Northern California. The US military has for decades stated its intense interest in climate engineering programs for strategic military purposes, i.e. "Owning the Weather by 2025". Is it yet another coincidence that Monsanto (the world's largest genetically modified seed company) has introduced its newest drought and aluminum resistant corn in the midst of this unfolding disaster? The Raytheon Corp. is heavily involved in weather modification patents. 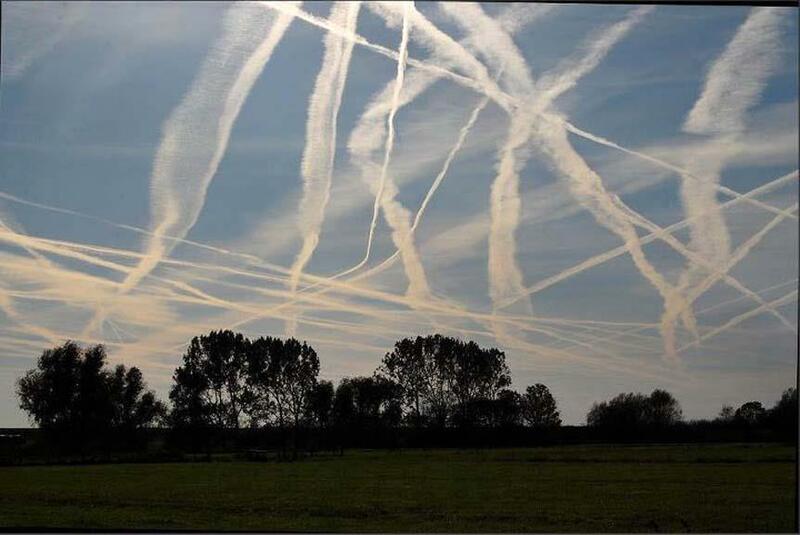 Another player in this gamble on the future of our planet is the Lockheed Martin Corp. who is also heavily invested in the weather modification business. Though mainstream media would never discuss this, we are currently in the sixth mass extinction on planet Earth. One has to wonder - are they trying to kill us all? Why? These are questions that every citizen around the world should be asking. 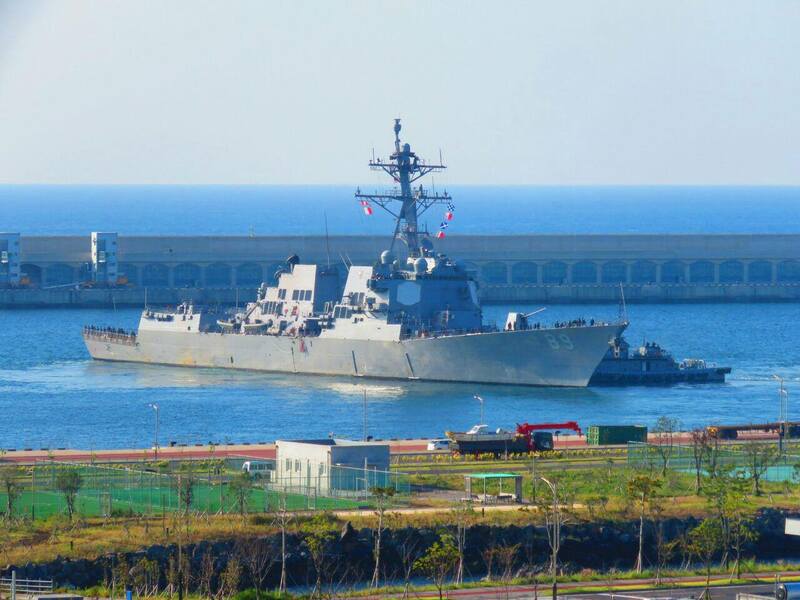 On Oct. 22, another US Aegis destroyer Mustin [built at a shipyard in Pascagoula, Mississippi] came to Jeju. It has recently joined ROK-US war exercise in the west sea water of Korean Peninsula and a part of MCSOF: Maritime Counter Special Operation Force. We had a press conference yesterday and have been busy to monitor and protest. And it has been 15th day as of today that a man named Kim Kyung-bae, vice-chairman of the anti-2nd Jeju airport project, Seongsan, Jeju, carried out hunger strike against the project. Beside the matter of developmentalism, it would be very likely to be used as an air force base as well. Before it came to the base, it had joined the recent ROK-US Maritime war exercise (Oct. 16-22) in the west water of the Korean Peninsula, as a part of MCSOF. The media reported its terrible gun fires on the sea. The 350 person crew of 9,200 ton guided missile destroyer came here with the reasons of so called 'munition-loading' and 'break' on surface. But as they openly said, what is left behind in the Island of Peace after their leaving is large amount of filth and trashes, as well as the soil of Jeju trampled by them. _The Gangjeong Sea cries out! Go away, all warships! _Close the Jeju navy base! It intensifies military tension! _Stop all the militarization of Jeju, Island of Peace! _Stop all the ROK-US and multinational war exercises! _Jeju is not a garbage dump for foreign militaries! Where is Niger? What is AFRICOM? The desire to be affirmed by American society has dangerous consequences for black people. This pernicious dynamic creates the inclination to worship any black face in a high place or to defend questionable activity. The death of special forces Sergeant La David Johnson in Niger is a case in point. Donald Trump’s racism and stupidity prevented him from performing the simple task of conveying appropriate condolences to Johnson’s widow. The ensuing brouhaha focuses on what Trump said in the phone call overheard by Congressional Black Caucus [CBC] member Frederica Wilson. At this juncture in history all talk of patriotism is at best foolish and at worst a call for continued crimes and mass murder. It is also high time to end the deification of the American war dead, even when they look like us. They die because they are trying to kill other people. Condolences to Johnson’s family are appropriate but they are also appropriate for the millions of people who lost loved ones to American empire building in Niger, Somalia, Libya, Yemen, Afghanistan, Syria, and Iraq. That is a short list which only includes the victims of American war crimes committed in the past 20 years. No one should be fooled by crocodile tears from white Americans with grudges against Trump. If Sergeant Johnson had been killed by a police officer in an American city many of the same white people who now rush to call him a hero would either shrug their shoulders in indifference or applaud his death. They should not be allowed to jump on the bandwagon of fake concern because Trump is their target. As for congresswoman Wilson, she has a golden opportunity to discuss the impact of American interventions abroad and question their rationale. But like the rest of her CBC colleagues, her interests are confined to reliance on the largesse of the Democratic Party and their corporate benefactors. Trump’s bad behavior makes him an easy target for scorn and a convenient punching bag for the useless black political class. If Wilson wants to take on the president it ought to be for more substantive reasons. Likening his boorishness to “Benghazi” uses a right wing trope for ridiculous effect. Any discussion about Sergeant Johnson ought to point out that he was a victim of the poverty draft. 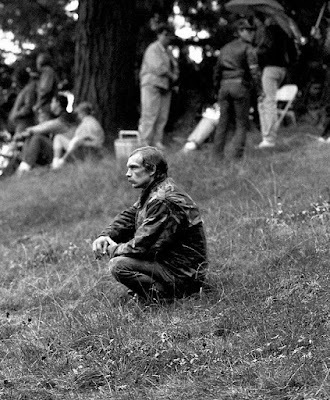 Before enlisting he worked at Walmart, a sure path to continued poverty or to the dubious odds offered by the army. Trump said that Johnson “knew what he signed up for” but that is probably not true. He took a chance and hoped for the best. Unfortunately the machinations of Bush, Obama, Clinton and Trump made his choice a bad one. If the Congresswoman wants to have a debate she could start with the realities of Johnson’s life and how it ran afoul of United States foreign policy. Only then would her fight with a president be worthwhile. ~ Margaret Kimberley's Freedom Rider column appears weekly in BAR, and is widely reprinted elsewhere. She maintains a frequently updated blog as well as at http://freedomrider.blogspot.com. Ms. Kimberley lives in New York City, and can be reached via e-Mail at Margaret.Kimberley(at)BlackAgendaReport.com. Video of Maine Peace Walk panel discussion at Unitarian Church in Brunswick on October 17. Joyakgol – South Korean peace activist from Jeju Island who has been working for the past 20 years to stop US base expansion in his country. 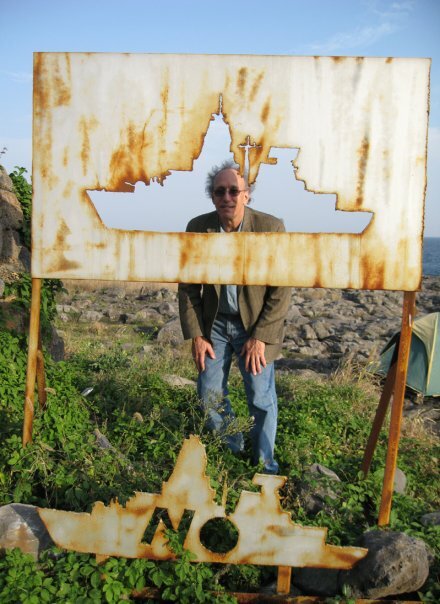 He also works to protect the endangered Indo-Pacific Bottlenose Dolphins who daily circle Jeju Island and are now threatened by the new Navy base. Destroyers built at BIW have begun to port at the new base. Leslie Manning – Quaker activist will speak about budgets as moral documents and the need to build political support for cutting the bloated Pentagon budget. Ed Friedman – Local environmental activist will discuss BIW’s impact on the life in the Kennebec River. 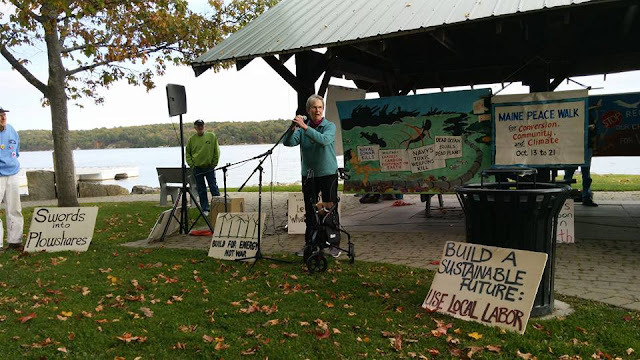 Mary Beth Sullivan – Social worker from Bath will speak about how conversion of BIW is possible and could create more jobs by building rail, solar, wind and tidal power systems to help deal with climate change. All are welcome at this table. Our goal is to work together - we need each other now more than ever. We are in a mess and we've all got to row hard if we want to survive. What is our most common agenda? Our group of peace walkers became a family. About a dozen were here all week. Others came in and out along the way. So there was always new energy to give us a spurt. Thanks to John Morris and Peter Morgan a plan was put in motion to systematically visit 95% of the doors in the community with flyers explaining the purpose of the walk. These were delivered over three days and we heard from some who read the flyers and thanked us. Morgana Warner Evans made her contribution by gathering food and then working with other volunteers to feed us. Mary Beth Sullivan helped coordinate the overall effort and MCed the finale event on Saturday. She and Karen Wainberg also helped nurture moving discussions inside one local church community as they considered our request to use their facilities throughout the week. A couple of Sunday's in a row they dedicated serious portions of the church program to discussing the walk. 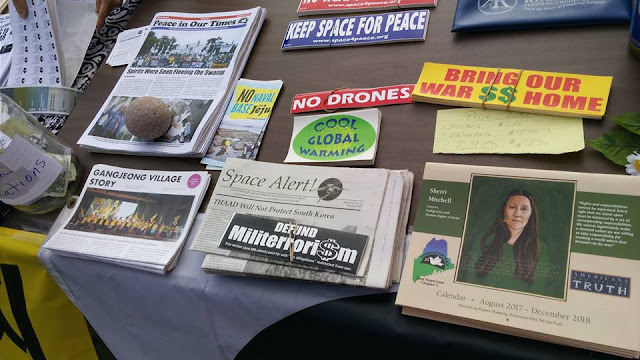 Dan Ellis ran the sound system at the finale rally and put all the peace walk materials on the Maine Veterans For Peace website. I've been posting things about the walk for the past week on a local Facebook page where folks share stories about Bath-Brunswick. Yesterday one person wrote back in response to my post: "If America's 'empire' is declining (and I doubt that it is) stuff like this just shoves it a little further along." Good to see someone noticed - one of the most important topics of our time. One retired BIW finance department staffer wrote saying the peace walkers should go find something constructive to do like feed someone in a homeless shelter. Another suggested that "Bruce must have flown in from Area 51." But there were a surprising number of likes when our walk logo was posted carrying announcements for pot luck suppers and such. The conversion of a destroyer into commuter rail, wind turbines and solar power right before your eyes on a big bright banner is a grabber. Art work is crucial to reaching many people - that is how I often have learned - visually. The walk art work came from two primary places - Russell Wray from Hancock and the statewide artist collective called ARRT! (Artists Rapid Response Team) that makes banners for various protest movements across Maine. The closing event on Saturday was really beautiful and the star of the show for sure was John Morris singing his country and western stuff. The rally was to begin at noon but at 11am we saw that the Farmers Market, being held in the same waterfront park, would close at noon. So we invited John to sing from 11am til the rally officially began at noon. It was the first time John had ever sung with a microphone - his steady style would never have given any clue of that. All in all it was a good show. We had fun and some new local people showed interest in what we are doing. Others who know the score, but are apprehensive to become associated with us publicly, hopefully will feel a bit more empowered to speak out and help protect the coming generations. We need more voices badly. For me it is fun organizing things like this but I am 65 now and focused on helping to develop and support younger people among us who are moving into this work on a regular basis. Will Griffin (who made most of the videos we have been posting) came up from Georgia and I know he learned alot from the experience. Please check out Will's video work at The Peace Report. The biggest surprise has been that our local newspaper, The Times Record, finally published an article about a panel discussion we held at a church in Brunswick last Tuesday. A reporter came and nothing appeared in Wednesday, Thursday or Friday editions. They don't publish the paper on Saturday or Sunday. But on Monday the story appeared on front page - top of the fold. A good story which you can read here. Better late than never. If it doesn't play on mainstream media it normally doesn't exist. We can't ultimately relay on the corporate controlled media to get our message out - that is why we walk and try to engage people. It's hard work but that is the reality of organizing. If you can build a great family experience while doing the work it becomes pure joy - and good exercise. We are living on a thin line and getting back to sanity ain't gonna be a breeze. Pour the last bit of the wine in the glass onto the ground ....remember the roots. Ecosystems War and Climate from Video Project on Vimeo. Walker Marsh and Farmer Nell are using flowers and healthy food to bring pride to their communities. because it was vacant of childhood memories. He turned 19 in Vietnam. From the senior prom to Vietnam. fumble, and ran with it through jobs and relationships. Along the way, he met Anne and got married. She had a secret that was as traumatic as Steve's. and Anne had been raped and betrayed by her Father. From one war zone to another. You see, they took their pain out on each other. It turns into a war zone of resentments. they ever met each other. At Jewish Voice for Peace, we were disturbed to learn that many of the organizations running these exchange programs are institutions in our own community, including civil rights organizations. To shut down the deadly exchange, we feel obligated to start with these complicit organizations in our own communities. They include The American Israel Public Affairs Committee, The Anti Defamation League, and even Birthright Israel. As Jews, we feel a particular responsibility to address those who run these programs in our names as Jewish communal institutions. Together, we'll bring this fight to the policy makers in our communities and hold accountable the policy makers that run and fund the deadly exchange. 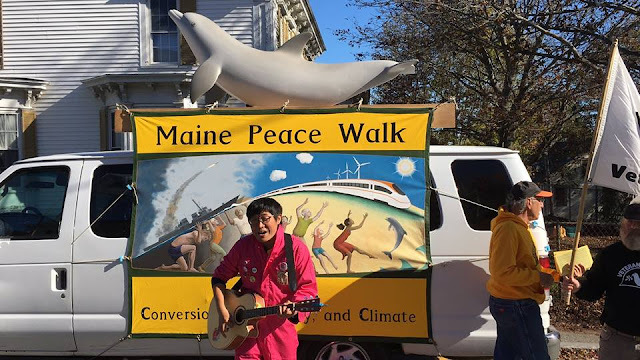 On Friday afternoon our Maine Peace Walk lined up outside Morse high school in Bath to greet the students as they left school. We got there 20 minutes before the bell rang and Yoyakgol started singing toward the building. We saw some students at windows on the 3rd floor clapping. When they came outside we handed flyers to many of them about our reasons for the peace walk.